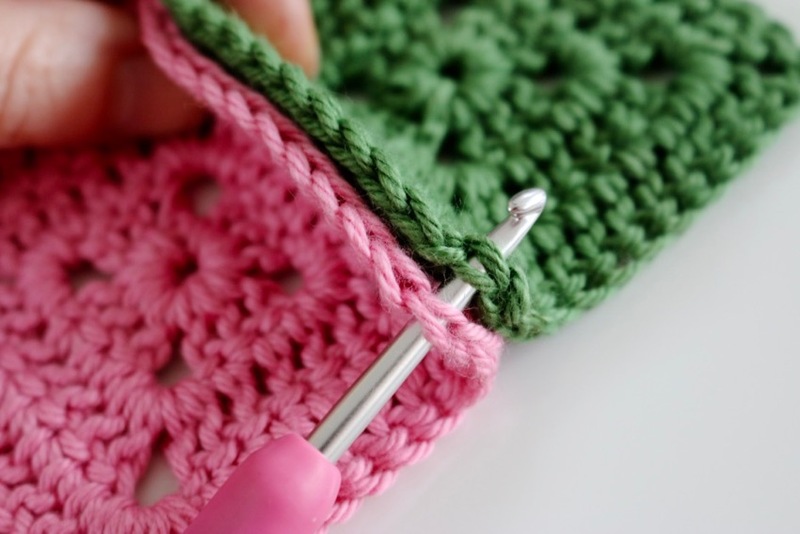 Using crochet to join motifs together is great if you prefer not to sew as all the joining can be done with your crochet hook. 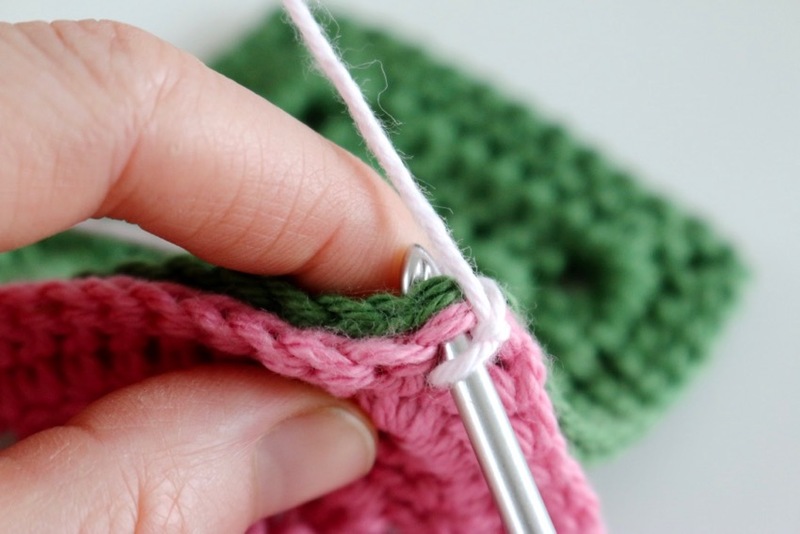 By joining from the back, as in this tutorial, you can mimic a sewn seam and depending on what colour yarn you use, also choose to make a feature of the join which can add a whole new dimension to your project. To join the squares together it's probably easier if you have already made all the squares you want to join. 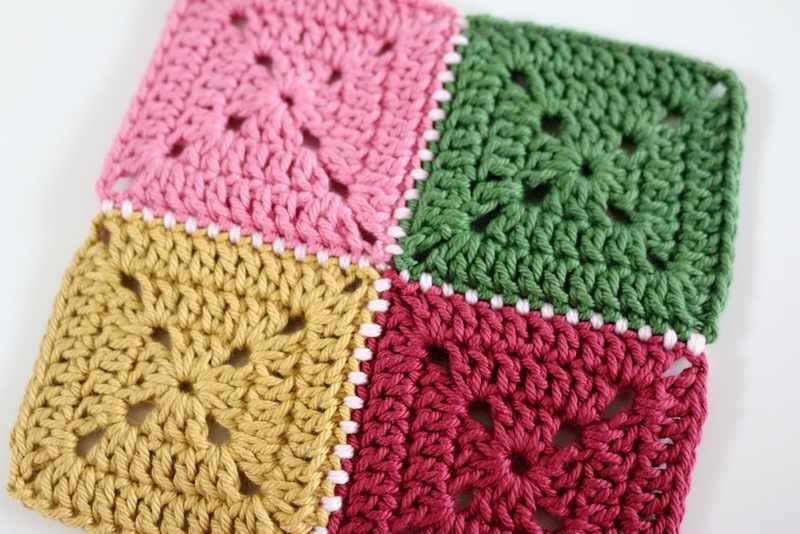 You'll be joining whole rows of squares to each other at once with this method, so if you are making a blanket or cushion for example, you can make all your squares and spend a little time arranging them. That way you'll be able to get the effect you want before joining them and you'll have a clear idea of which squares to join to each other as you work. 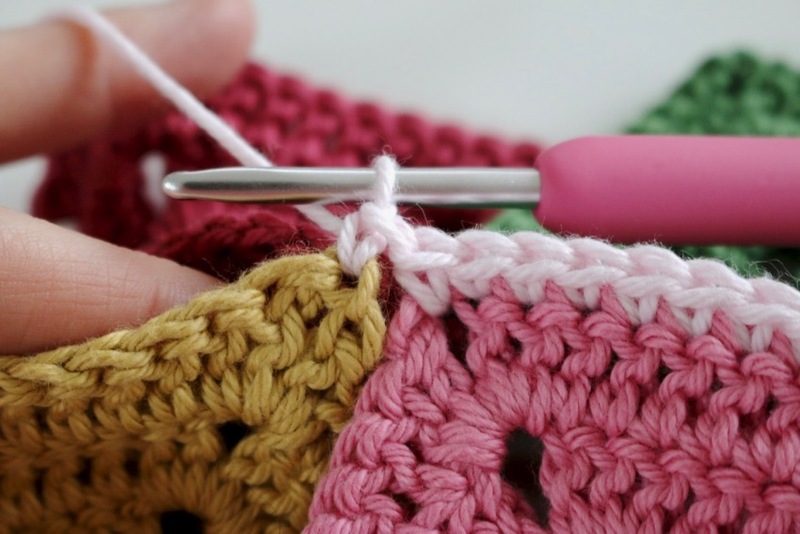 - Double crochet's (US sc's) through back loops only. 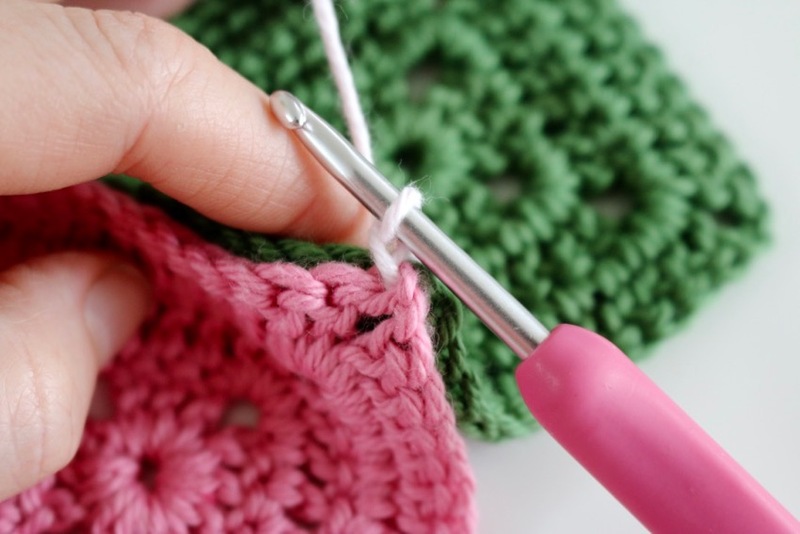 - Double crochet's (US sc's) through both loops. 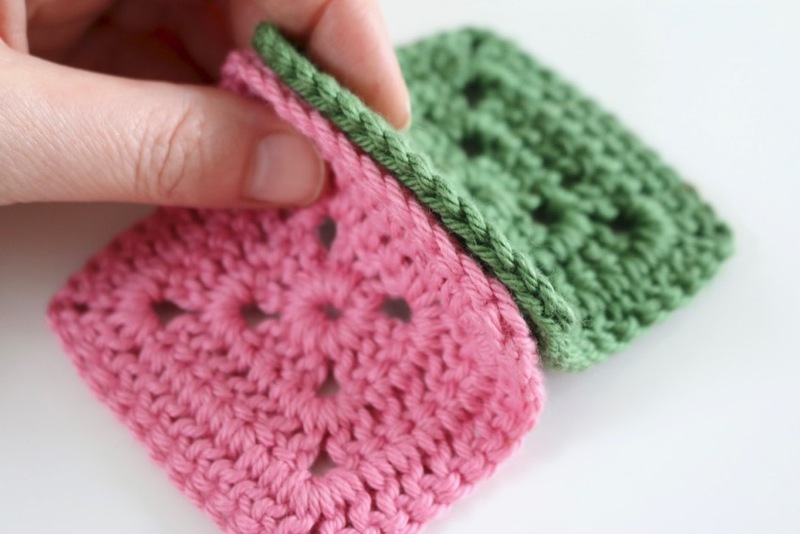 For this tutorial I'm going to show you how to join the squares together from the back, using both loops, but I'll show you examples of the other style of crocheted join at the end. 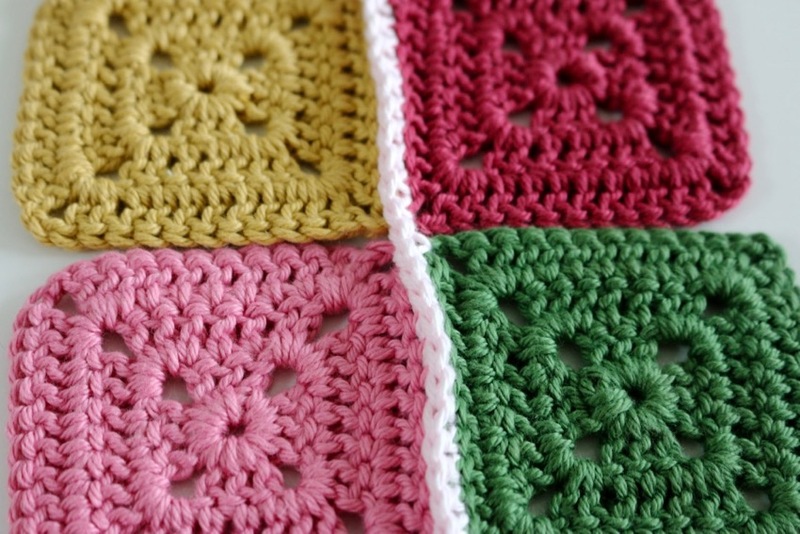 If you'd like more help with making the square motif, please have a look at my Solid Granny Square tutorial. 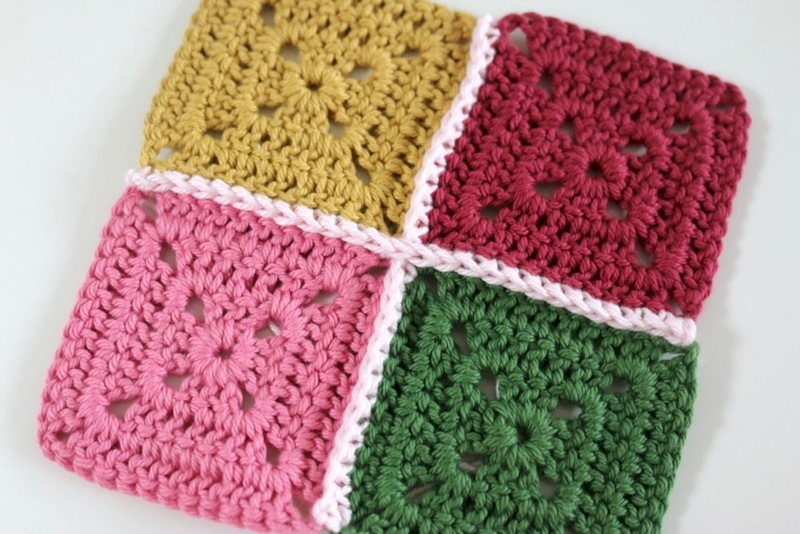 Imagine that your whole blanket is laid out, we are going to begin by joining the squares together by working along the rows horizontally, from right to left. We'll start by joining the first and second rows together so here are the first square or the first row and the first square of the second row and we're going to hold them so that the right sides are together and the wrong sides are facing out. 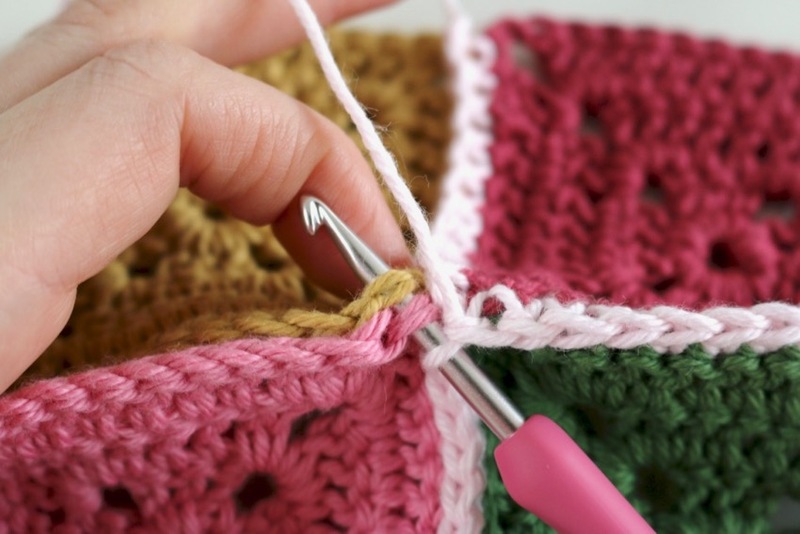 We'll start in the corner stitch of each square and we'll be working under both loops. So insert your hook under the both loops of the first square and then under the both loops on the next square. Pull a wrap your joining yarn over your hook and pull through all the loops and then make one chain. 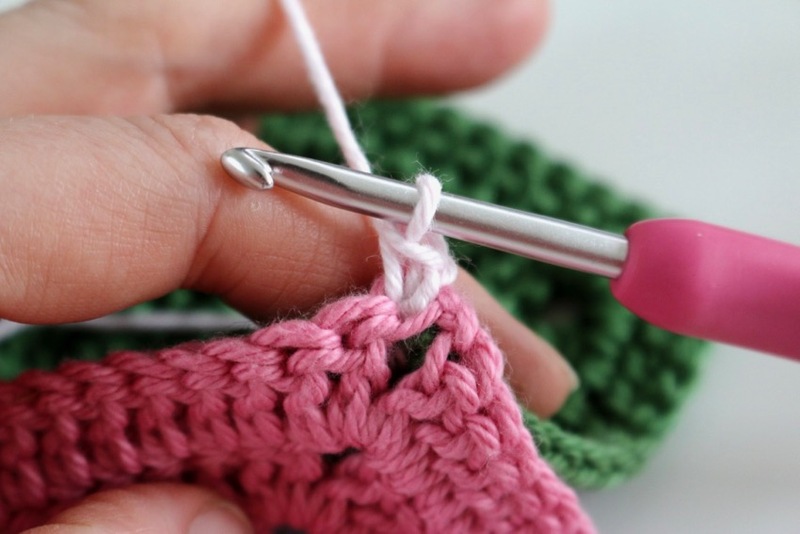 Now we'll make a double (single) crochet to start the join, so insert your hook into the same two sets of loops and make a double (single) crochet. 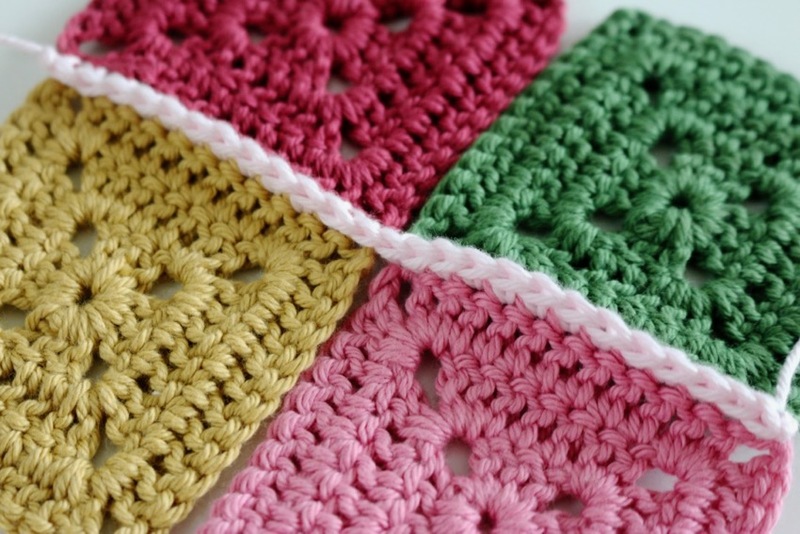 Then insert your hook under both loops of the next stitches on each square and make another double (single) crochet. 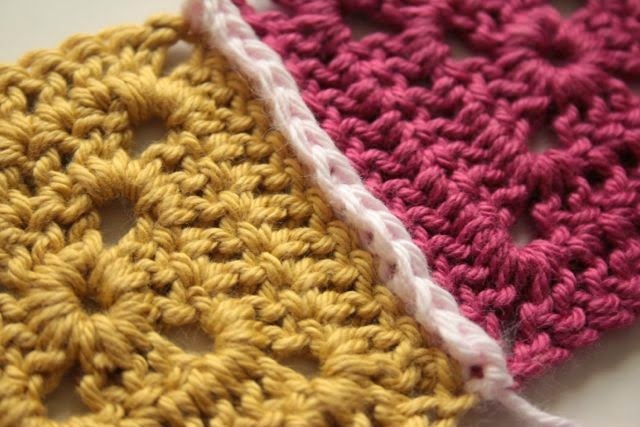 Carry on all along the edge of the two squares, making a double (single) crochet in each stitch. 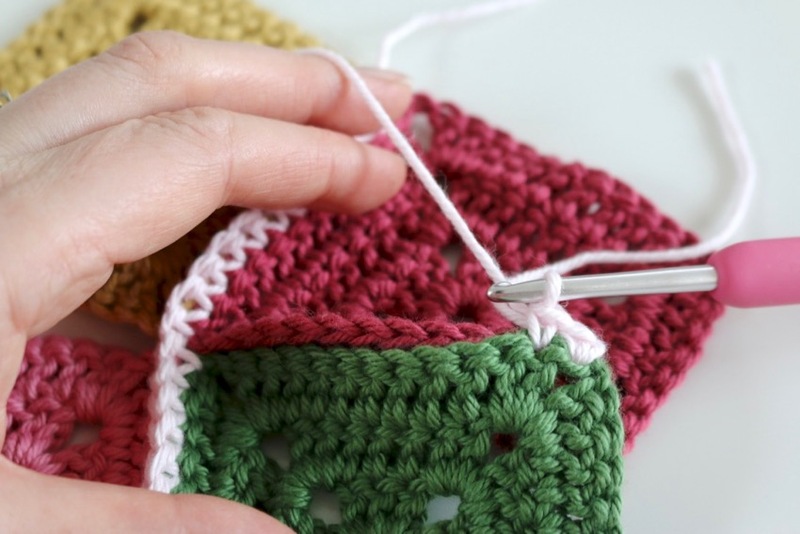 Remember to check that the stitches of each square are lining up each time, it can be easy to miss one, or put two in the same place and then your squares will not line up nicely. 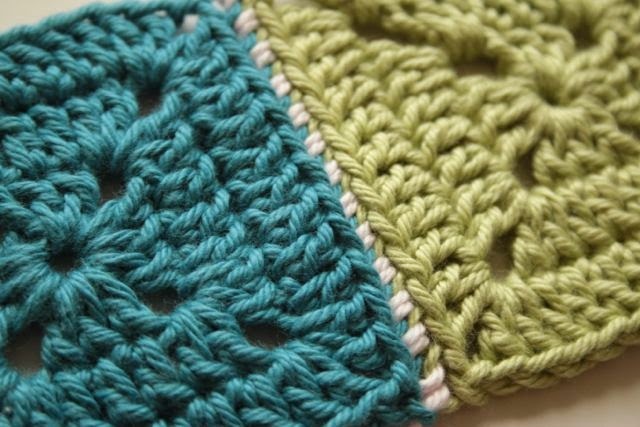 Hold the next two squares together in the same way, with the right sides facing outwards, and again, working under both loops of the stitches in each square, make a double (single) crochet into the corner stitch. 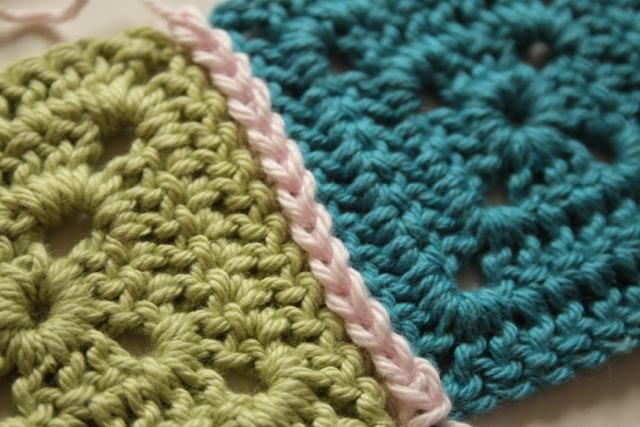 Then simply carry on along the sides of these next two squares until you have worked into each stitch. Continue on in this way until you have all of the first row and second row of squares joined to each other. Then you can break the yarn. Once you have joined rows 1 & 2, next join rows 3 & 4 together, then 5 & 6 and so on. Once that is done you can start joining rows 1 & 2, to rows 3 & 4 and so, until all the rows linked and all the horizontal joins have been made. Now we can work on joining all the columns of squares together. So rotate your squares so that you can work from right to left again. 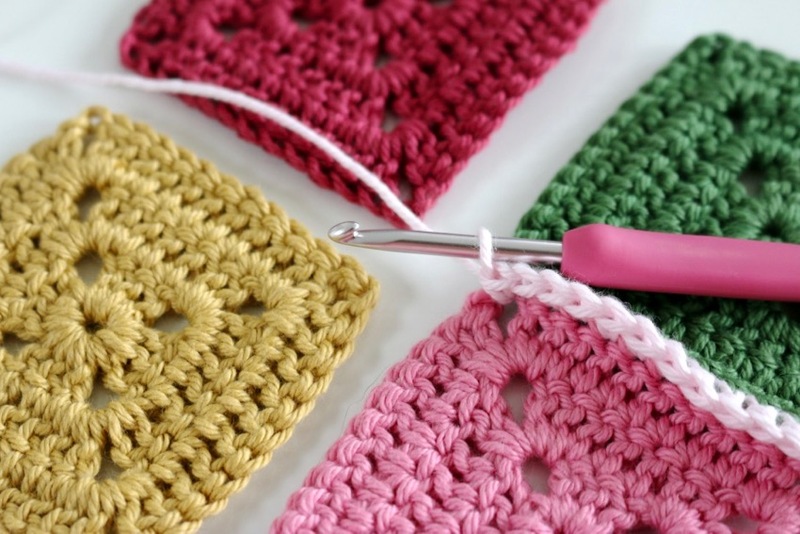 Now we just repeat the process, starting with your first set of squares, pull a loop of your joining yarn through, make 1 chain and then make a double (single) crochet in the same place. 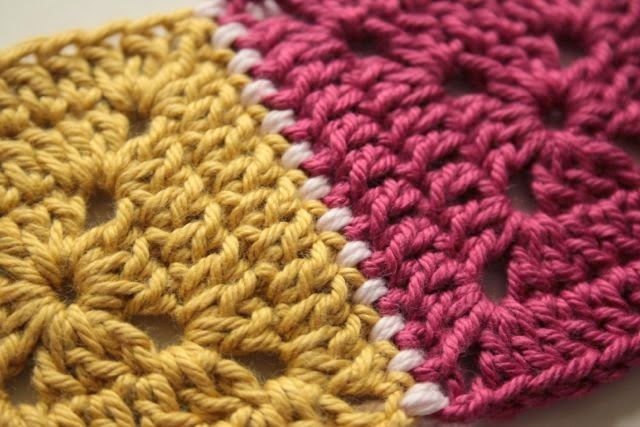 Then make a double (single) crochet into the both sets of loops of each stitch on the two squares. 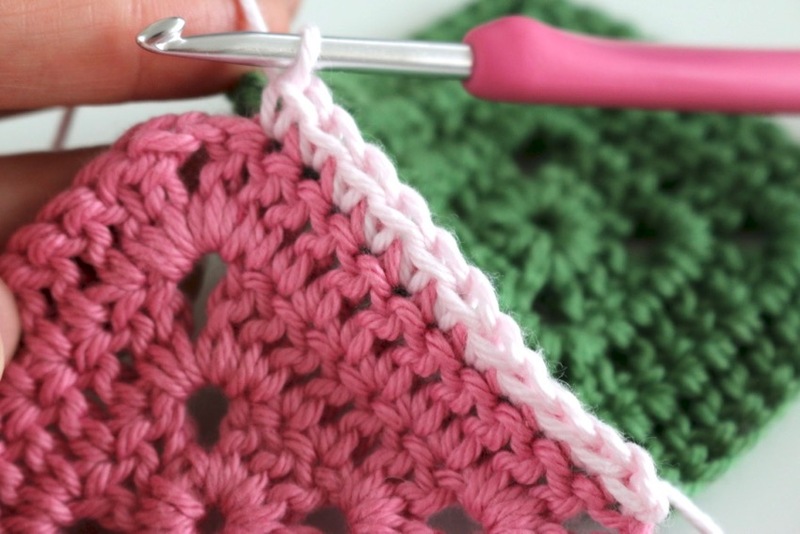 Once you reach the corner, you'll meet your joining crochet stitches going the other way, but don't break the yarn because we can work straight over this. 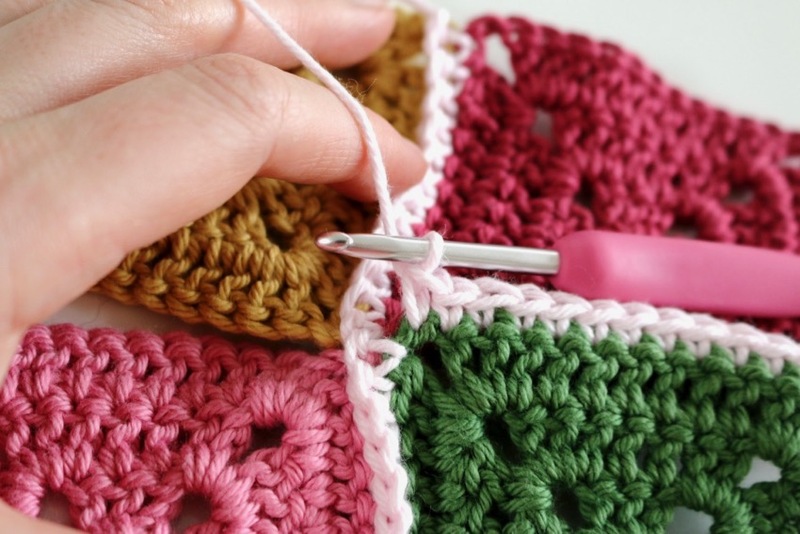 After you have made the last stitch in the previous two squares, just insert your hook into both loops of the corner stitches of the next two squares and make a double (single) crochet in the same way as normal. Carry on working into each set of stitches for all the squares along the column to the end, working over each line of joining crochet that you meet as described above. Then all you need to do is repeat the same process for all the remaining columns until they are all joined. 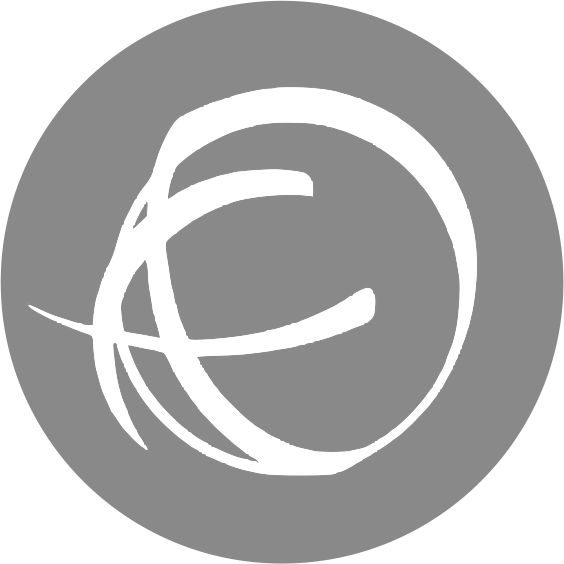 Once all of the joins have been made, you can simply flip the work over to the front again. Again, this is similar to the above as it was also worked with the backs of the squares facing outwards, but by crocheting under both loops of the stitches the effect is a little more prominent. And the back looks very similar, but again, the ridges stand a little prouder of the work. This gives a totally different look to the front of your work and does quite a good job of mimicking a sewn seam. Here is the back, which of course has the ridges as the squares were held with the right sides together this time.